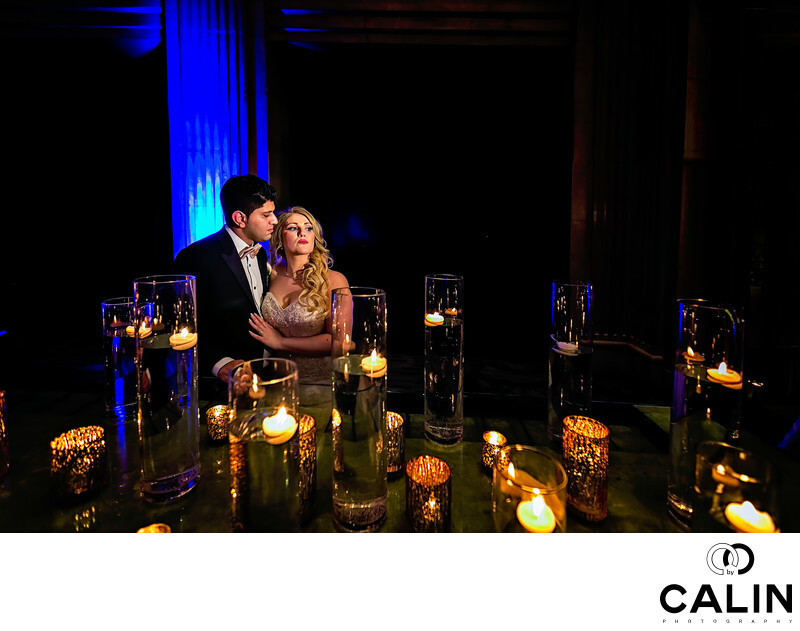 This romantic photo was captured during the wedding reception at One King West. While the guests were enjoying the dinner, I asked the couple to join me for a quick sneak out photo shoot that lasted no more than ten minutes. This wedding picture was captured in the Grand Banking Hall. The former check desks were adorned with a multitude of candles that created an interesting foreground element in this image. The orange light emitted by the candles complements the blue light illuminating the column behind the bride and groom. For this scene I envisioned a fashion look where one of the subjects (the bride) does not look at the other. I used a 16-35mm lens to capture the grandeur of the Grand Banking Hall. To illuminate the photograph and preserve the ambient light, i.e. used a Lowel GL1 continuous light. After this shot, we went to the lobby and took some more photos the couple adores. From composition standpoint, I positioned the bride and groom in the spot that offered the highest contrast between their figure in the background so that they are separated from the backdrop. The image includes a lot of dark negative space, which makes the bride and groom "pop" out of the frame. The shot has three layers: the candles constitute the foreground. The bride and groom are placed in the middle ground while the blue column in the dark curtain create a beautiful backdrop. The only processing I applied to this image was dodging and burning to emphasize the newlywed couple.